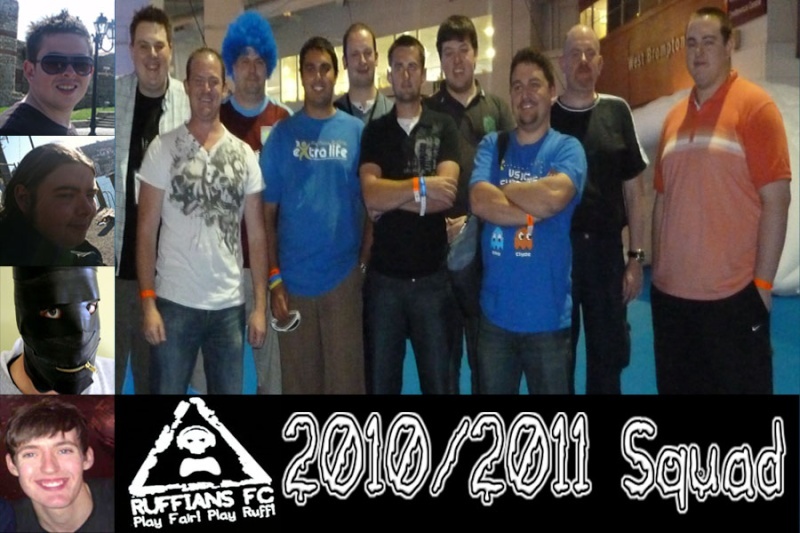 So with the arrival of FIFA 12 it brings a new season in for RuffiansFC to take part in but it also sees the end of the last season - 2010/11. It was RuffiansFC second full season as a team and I have to say the team has grown beyond anything I had thought it would when I first set Ruff FC up. So when we had a chance for a large part of the team to meet up at this years Eurogamer Expo in London (was really great meeting you all) I had to try and get a team photo for the site. We managed it with the help of Twitter, my poor camera skills and ofcourse lets not forget the main man who works his magic at the Ruff Gaming Graphics department - MickyB! Of course sadly we couldn't get everybody to Eurogamer but with Micky's help we have added some of the missing players to the team photo as you can see below. Hopefully we can try and do another team photo at next years Eurogamer Expo and of course a good excuse to meet up with you all again. Boxes on the left of the photo starting at the top working down to the bottom - MickyB, Mikethemute, Baw Kicker, Obesia Blue. Also I just want to say a massive thanks from me and the whole of the team to MickyB for his great work on the team photo, he has done a fantastic job - Cheers Micky! P.S Yes that is really a picture of Baw Kicker in the Gimp suite! Haha nice work. Wish I was there. How tall are you all? You look like giants. I'm only about 5"7 lol! But ruff is so tall he should have been in shadow of the colossus!! Darkestfrost wrote: I'm only about 5"7 lol! But ruff is so tall he should have been in shadow of the colossus!! That will be great - I want to get as many of the team again together at next years Eurogamer. I will start planning alot earlier this year and will let everybody know soon as I see the tickets go up on sale! I was there, watching you all from the shadows..... with my gimp suit on.